Government spending on the Private Health Insurance Rebate will continue to stagnate over the next four years according to the 2019-20 Budget - feeding into the affordability challenge. 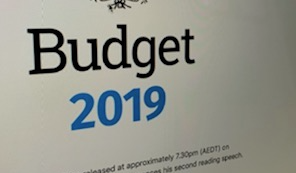 Tuesday's Budget has confirmed that spending on the program that provides direct financial support to millions of Australians with private health insurance remains almost unchanged compared to last year. Spending on the program will range from $6.3 billion to $6.8 billion over the years to 2022-23 - significantly in line with what was announced in last year's Budget - representing an average annual growth rate of around 2 per cent. The rebate has been the subject of a range of reforms in recent years that have combined to reduce its contribution to premiums. The reforms have included means testing and indexation to the cost of living, rather than premium increases, meaning its contribution to premiums declines every year. At the same time, spending on Medicare will rise at an average annual growth rate of 5.5 per cent, rising by almost $6 billion over the years to 2022-23 and topping $29 billion. Annual federal government spending on public hospitals will rise by over $4.5 billion over the years to 2022-23 - an average annual growth rate of almost 5 per cent. The Budget included $1.1 billion for a primary care package. The package included $448.5 million to improve the continuity of care for patients over 70 with chronic conditions, Quality Incentive Payments for general practices ($201.5 million), $62.2 million for rural generalist training and $187.2 million for lifting the freeze on GP items. The AMA described the package as a "welcome boost". According to national president Dr Tony Bartone, “Australia’s hardworking GPs will be happy to see a commitment of almost $1 billion to general practice. This includes matching Labor’s promise to bring forward by a year the lifting of the freeze on rebates for a range of Medicare GP items. Shadow health minister Catherine King criticised the Budget as "full of reheated announcements”. She said Labor would bring forward the restoration of indexation for GP Medicare item numbers and boost public hospital funding by a further $2.8 billion. The Medical Technology Association of Australia (MTAA) welcomed the Budget, including $45.5 million for radiation therapy in regional Australia, and investment in health and medical research through the Medical Research Future Fund. “The announcement that $45.5 million will be spent on radiation therapy for regional Australia is especially welcome and is something the sector has been calling for," said CEO Ian Burgess. “The medical technology industry welcomes the Government’s commitment to healthcare in Australia and we look forward to continuing to contribute to helping people live longer, healthier and more productive lives,” he added.